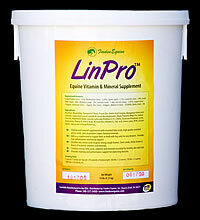 LinPro™ is an Equine Vitamin & Mineral Supplement for Performance and Adult Horses. From excellent hoof growth and superb, shiny hair coats, to helping keep the horse in peak condition - your horse will look and feel like a million bucks! The pelleted formula is designed to be highly palatable. LinPro™ supports nutritional needs in horses that are sensitive to carbs in the diet; supplies amino-acids as well fatty acids, minerals and vitamins. As a balanced nutritional supplement, LinPro™ can be added to regular feed, or can be fed with hay only for easy keepers. Overall Nutrition and Health. LinPro™ provides a balance of vitamins, minerals, amino acids and fatty acids as nutrients for a healthy body. Vitamins A, D, and E promote healthy membranes throughout the body. Calcium iodate, a form of iodine, supports healthy thyroid function. Performance horses. Excellent for horses that ‘fade out’ before the end of a performance. Adding 4 - 6oz of LinPro™ per day to grain meals enables the horse to stay trim while providing training and performance support for exercising muscles and the demands of work. Elderly Horses. LinPro™ provides a high quality protein source with absorbable minerals in a pelleted form that is easy to eat and digest. The balance of vitamins, minerals, amino acids and essential fatty acids complement the animal’s regular diet. Helps maintain healthy weight in older horses without the extra fat. Hoof Growth. LinPro™ provides biotin, methionine, amino acids and essential fatty acids needed for rapid, healthy, strong hoof growth. Gives weak, shelly hooves a boost of essential vitamins and minerals. Supports cracked hooves and strengthens hoof walls. Supports hoof growth in horses recovering from founder. Healthy Skin & Coat. LinPro™ is rich in essential fatty acids, vitamins and minerals that are needed for soft, silky, shiny and healthy coat, mane and tail – makes the horse look great! Strong, Healthy Bones. LinPro™ contains calcium, phosphorus, magnesium and vitamin D to help maintain strong, healthy bones. Adding LinProTM to the diet may reduce the risk of physitis developing in faster-growing foals and yearlings.